Research has shown that people with different thinking and decision-making styles -- and who represent varied demographic backgrounds -- can strengthen the resilience, flexibility, and overall performance of a governing body. Twice as likely to reach financial goals. Three times more likely to be high performing. Six times more likely to be innovative and agile. Eight times more likely to achieve desired business outcomes. Stacia recognized that pools have some constraints in achieving full cognitive and demographic diversity, but also shared ideas pools can use to enhance diversity elements. One method is to build a pipeline for identifying future board members from a pool’s full membership, through things such as committees or workgroups. 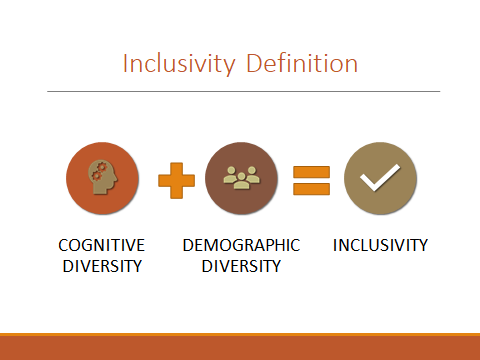 Another way to intentionally build cognitive and demographic diversity is through a board composition matrix that can help identify opportunities for cognitive diversity and further inform board recruitment work. Webinars: Stacia will present two webinars in May on why and how cognitive and demographic diversity on governing bodies builds resilience and effectiveness. Intelligence: Read the February 2019 issue of Intelligence for in-depth ideas about governance inclusivity, including details on board composition matrices and nine pool-specific ideas for building cognitive and demographic diversity. Conference Materials: Review Stacia’s conference materials on why and how to build governance inclusivity. For a broad view of the value of inclusion, check out The Difference that Difference Makes for Pools, a summary of the Governance & Leadership keynote presentation by András Tilcsik. Learn about unconscious bias from two presentations at the Governance & Leadership Conference by Lori Nishiuri Mackenzie, executive director of Stanford’s Clayman Institute for Gender Research. Dr. Robin Hindsman Stacia is the CEO and Principal Consultant of Sage Consulting Network, Inc., a Senior Governance Consultant with BoardSource and a Licensed Consultant for the Standards for Excellence® an Ethics and Accountability Code for the Nonprofit Sector.